Swami Prabhavananda (December 26, 1893 – July 4, 1976) was an Indian philosopher, monk of the Ramakrishna Order, and religious teacher. Born in India, he joined the Ramakrishna Order after graduating from Calcutta university in 1914. He was initiated by Swami Brahmananda. In 1923, he was sent to the United States of America. Initially he worked as an assistant minister of the Vedanta Society of San Francisco. After two years, he established the Vedanta Society of Portland. 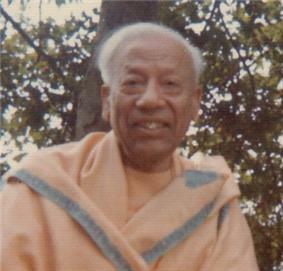 In December 1929, he moved to Los Angeles where he founded the Vedanta Society of Southern California in 1930. Under his administration the Vedanta Society of Southern California grew over the years to become the largest Vedanta Society in the West, with monasteries in Hollywood and Trabuco Canyon and convents in Hollywood and Santa Barbara. Prabhavananda was a scholar who wrote a number of books on Vedanta and Indian religious scriptures and commentary. He was assisted on several of the projects by Christopher Isherwood or Frederick Manchester. His comprehensive knowledge of philosophy and religion attracted such disciples as Aldous Huxley and Gerald Heard. 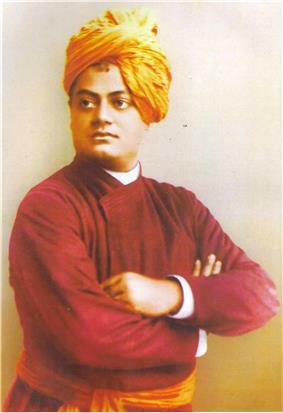 Prabhavananda died on the bicentennial of America's independence, July 4, 1976, and on the 74th anniversary of the death, or mahasamadhi, of Swami Vivekananda, the founder of the Ramakrishna Order in India and many of the Vedanta centers in America and Europe. Christopher Isherwood wrote a book, My guru and his disciple, that described his more than three decades (1939–76) as a student of Prabhavananda (see also historical work by Copley). Prabhavananda's book The Spiritual Heritage of India was reviewed in the academic journal Philosophy. The review stated that "Swami Prabhavananda has written a charming and authoritative book on the spiritual heritage of India, by which he means that heritage in consonance with the Vedic tradition and its culmination in Vedanta" (p. 376). The reviewer stated that "throughout the book breathes an air of relaxed simplicity and conviction.... I was particularly refreshed by the absence of attacks on science, materialism, naturalism, and other such means to spiritual fulfilment" (pp. 376–377). Prabhavananda and Christopher Isherwood's translation of the Bhagavad Gita was reviewed by Time Magazine in 1945. Time described the translation as "a distinguished literary work" that was "simpler and freer than other English translations (three of which have been published in the past year).... It may help U.S. readers to understand not only the Gita itself, but also its influence on American letters through one of its greatest U.S. admirers, Ralph Waldo Emerson" (pp. 98, 100). Prabhavananda's work was the subject of a 1979 book by Cyriac Muppathyil, published by the Pontifical Gregorian University in Rome, that examined how Prabhavananda's (and Hinduism's) conception of meditation might inform the Christian practice of meditation. After surveying Prabhavananda's thought, Muppathyil examines "the merits and demerits" of his interpretation of meditation, surveys "the principles for a Christian integration of Hindu meditation," and ends by "presenting meditation as a meeting-point for Hindu-Christian dialogue" (p. 5). Reviewed by magazines and professional journals. ^ Robert J. Ray (1963). [review of Prabhavananda's The Spiritual Heritage of India]. Books Abroad [continued by World Literature Today], v37 n1, p. 101. ^ William Gerber (1964). [Untitled - review of Prabhavananda's The Spiritual Heritage of India]. Philosophy East and West, v13 n3, pp. 261-262. ^ David G. Bradley (1964). [Untitled - review of Prabhavananda's The Spiritual Heritage of India]. Journal of Bible and Religion [predecessor of Journal of the American Academy of Religion], v32 n2, pp. 186-187.